...that didn't quite get their cards out by Christmas you still have a few more days if you send out a happy new year cards, like this one from campbell raw press. I just love all the constellations on it! so cool! wish I had one to still send out and I would get THIS one! But glad mine are out!!! I'm loving the idea & the card!! Almost makes me wish I didn't send out my Christmas cards!! I love this concept. I didn't get a chance to send any out, this would have been perfect! Lovely cards! 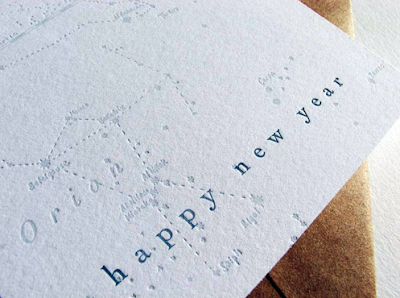 New Year Cards are perfect for me and my procrastinating tendencies!